These jazzy little blue diamond stickers are just $2 each and support the Alpha Delta Pi Foundation’s Annual Fund. This fundraiser held at each DLC helps our Foundation provide leadership programming, educational speakers, and opportunities for our members, including some of the programs your chapter members and officers participate in throughout the year. 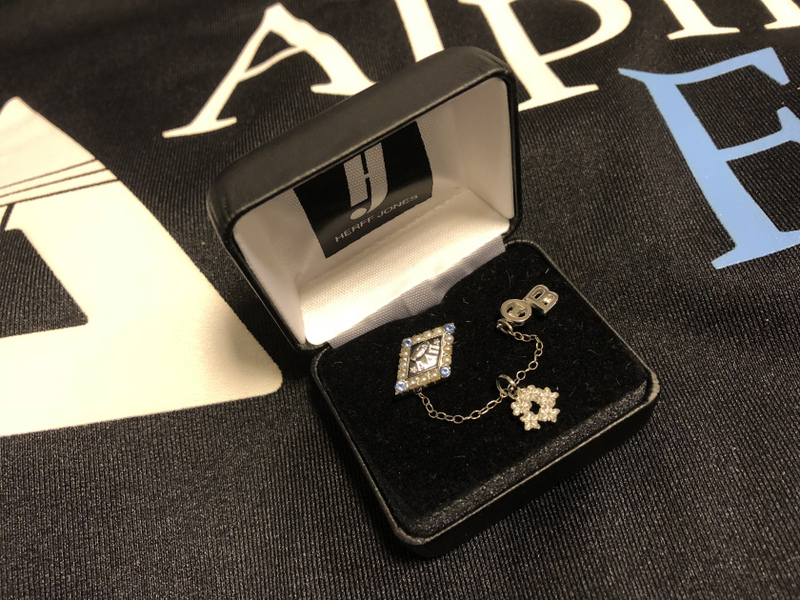 DLC Diamonds will be available at the Alpha Delta Pi Foundation display throughout the weekend. You can fill out the honor card and give a DLC Diamond directly to the person you’d like to honor. You can always keep a DLC Diamond for yourself too! The Foundation table will have ribbons so you can attach the DLC Diamonds you receive to your nametag. The 1851 Violet Circle is EXCLUSIVELY for our undergraduate sisters! Your gift of $18.51 to the Alpha Delta Pi Foundation’s Annual Fund allows you to become a member of the 1851 Violet Circle and, as a token of our appreciation, you get to select a silver or gold dangle for your badge. The design changes each year on August 1st, so you can collect all four during your time in school! You can join the 1851 Violet Circle at the Alpha Delta Pi Foundation display throughout the weekend, as well. You can also make a gift in honor of an undergraduate sister and give her the dangle – we’ll just ask for her name so we can give her credit for being a member of the Violet Circle. Membership is not exclusive to those who attend DLC; any undergraduate sister may join by making her gift at www.violetcircle.org. Have an amazing philanthropy shirt? Some of our District Philanthropy Directors will hold a philanthropy t-shirt competition during DLC. T-shirts at those conferences will be displayed for everyone to see. It’s a great chance to get some ideas on shirt design – and maybe even discover a new idea for a philanthropy event! To be eligible for the contest, t-shirts must reflect proper marketing guidelines and be picked up before you leave to return to your campus. Your District Philanthropy Director will let you know if you should plan to pack a philanthropy t-shirt for the contest. Trustees and staff of the Alpha Delta Pi Foundation are excited to see our sisters at DLC starting in just a few short weeks! Thank you for your support!